Ever feel like you need to just escape to the mountains? Beech Mountain, North Carolina, may just be what you’re looking for! This alpine escape offers the perfect blend of adventure and relaxation. Nestled among the Blue Ridge Mountains at an elevation of over 5,500 feet, Beech Mountain is the highest town in Eastern America. Though primarily known as a winter destination for skiing, there are plenty of things to do in and near Beech Mountain year-round. 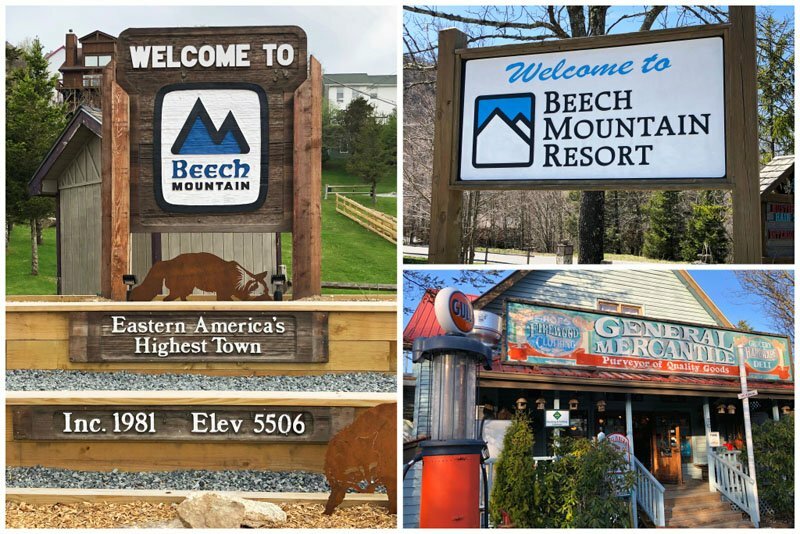 Though there are a handful of hotels in Beech Mountain, we recommend you look into Beech Mountain rentals. 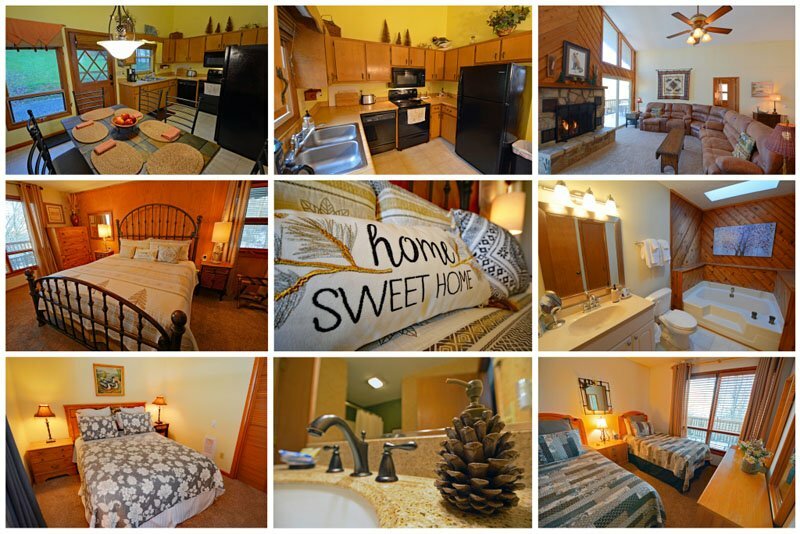 Vacation rentals in Beech Mountain offer the conveniences of home at a price often more affordable than a hotel. We rented a charming mountain chalet located just 165 feet from the ski slopes. Its proximity to the slopes makes it an ideal winter rental. Even in Spring, Summer, and Fall, you can’t beat the location! 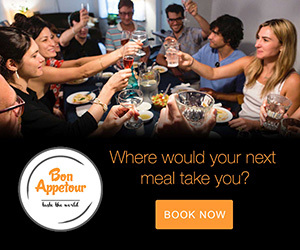 The chalet is close to several Beech Mountain restaurants, shops, and bike trails. 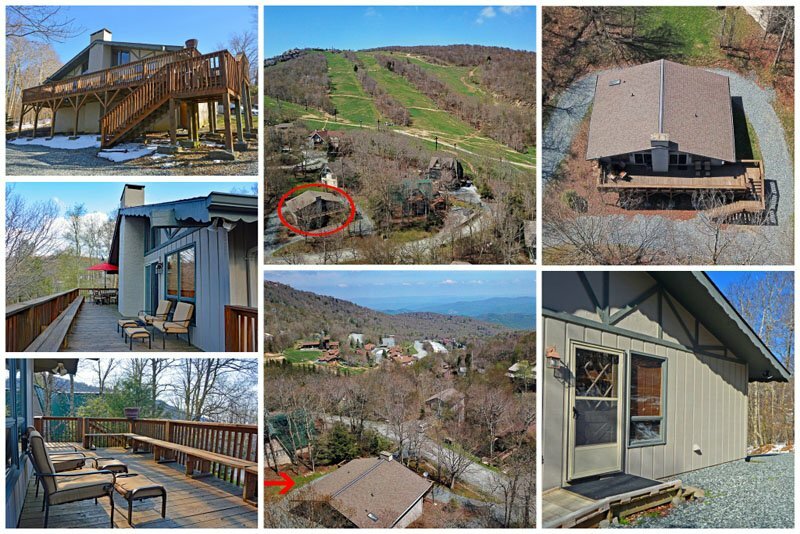 This particular 3 bed/2 bath Beech Mountain rental is well set up to provide ultimate comfort. With a well stocked full kitchen and a dining room that seats 6, you can prepare meals at home on days you want to stay in. There are heated blankets in every bedroom and a wonderful gas log fireplace in the living room to keep you warm on chilly days. The beds are all super plush and each bedroom is individually temperature controlled to ensure that everyone is comfortable. If you visit during Spring or Summer, the back patio provides a great place to relax and unwind after a long day of exploring. 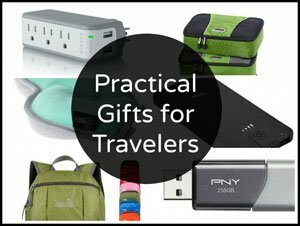 Other luxuries include washer/dryer and WiFi connectivity. So, whether you’re looking for a family getaway, a ski trip, or a quiet mountain escape, we can definitely recommend a stay at this charming Beech Mountain lodging option. 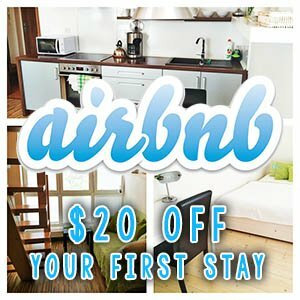 If you’ve never used AirBnB before to book a vacation rental, be sure to book through our unique code to save money on your first stay! Our multi-week early Spring visit to Beech Mountain fell right between the last snowfall and before the trees began to bloom. The winter air still lingered, making it perfect weather for getting out to explore. Due to its high elevation, there are really only a few days of truly hot weather in the peak of summer. Otherwise, you’re looking at mild summer temps, chilly days in Spring and Fall, and plenty of snowfall in the winter. As such, there are plenty of things to do in Beech Mountain no matter when you choose to visit. It goes without saying, Beech Mountain is a skier’s paradise. Because we did not visit during the winter months, we did not partake in Beech Mountain’s most popular activity. As such, we don’t have much to say on the topic. Instead, we recommend you to refer to Beech Mountain Resort for more information. 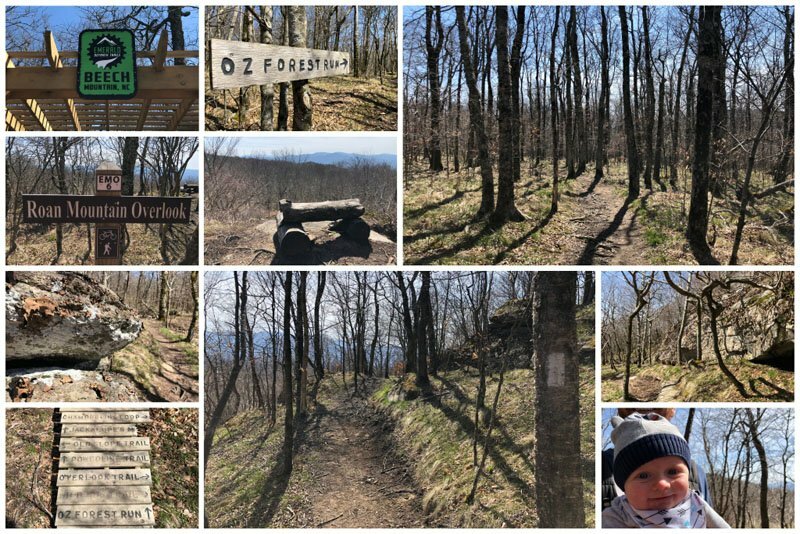 We explored a few hikes on Beech Mountain and wanted to share our favorites. 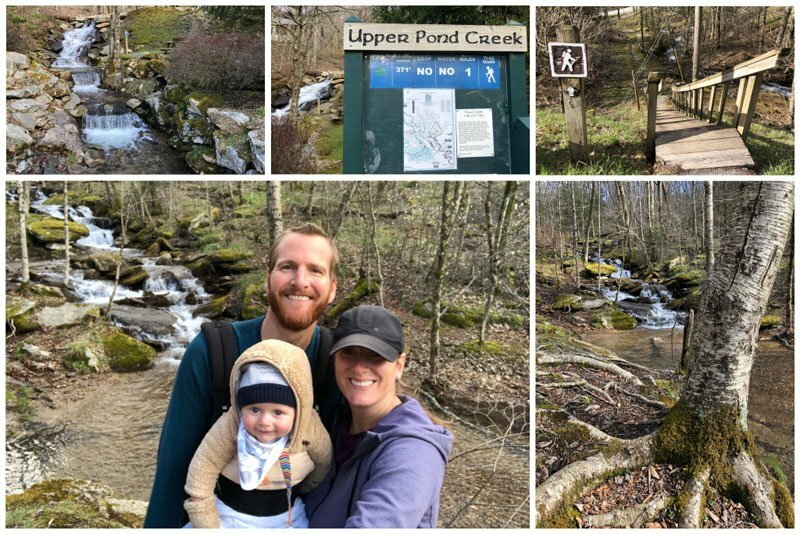 It’s not hard to see why Upper Pond Creek Trail is considered a Beech Mountain best hike! This easy one mile (each way) hike starts at Perry Park off Tamarack and leads down to the Lake Coffey recreation area. (Note, the trail begins across the street from the Upper Pond Creek sign, waterfall, and picnic area. We almost got started on the wrong path.) The elevation change for this trail is just under 400 feet. You only really notice this change on the way back up to your car! Of course, you have the option to start the hike at Lake Coffey to get the uphill out of the way first. We found ourselves in awe at the beauty along this trail. Pebbled paths and boardwalks lead through gorgeous wooded areas. It had rained for a few days prior to us hiking Upper Creek Pond Trail, so the creek was flowing at full force! You might find yourself a little envious of several of the houses along the trail. What a relaxing backyard these fortunate homeowners have! Throughout the hike, you’ll come upon 15 educational signs with information about the surrounding flora and fauna. We can’t recommend this hike enough. It’s family-friendly and absolutely gorgeous. We can only imagine how much more beautiful it looks once the trees and flowers are in bloom. 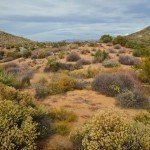 The Emerald Outback Trail System is a network of 7 trails totaling over 8 miles, varying in terrain and level of difficulty. The trails are located near the summit of Beech Mountain and have been meticulously designed with hikers and bikers in mind. Because the trail system is situated at over 5,000 feet, you don’t have to hike too high or too far to see some panoramic vistas! There is an elevation change of 450 feet throughout the whole trail system. Again, some trails are easier that others. We selected the Oz Forest Run trail coupled with Wizards’s Way for a relatively easy 2+ mile hike. You can end your day by heading to the nearby (and appropriately named) Sunset Park to watch the sun dip down below the Blue Ridge mountains. No need to head down the mountain quite yet… there’s still plenty more to do in Beech Mountain. If you’re a fan of the Wizard of Oz, you’ll want to visit the Land of Oz theme park located at the summit of the mountain. The park officially closed back in the 80s, but restoration efforts have been underway and the park opens to the public for limited occasions. Autumn at Oz Festival and Journey with Dorothy Tours are two of those occasions. Check the Land of Oz website for more information and opening information. 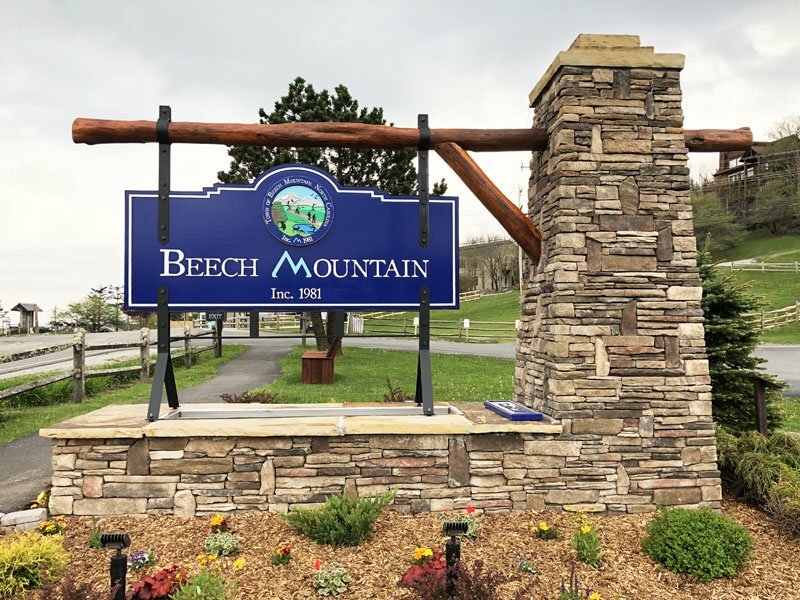 Don’t miss a visit to Beech Mountain’s main attraction – Beech Mountain Resort (open during the summer and winter months). Live music and spirited festivities take place at the resort all summer long! And of course, in the winter months, there’s plenty of skiing, snowboarding, and snow tubing adventures to be had! Grab a beer at the Beech Mountain Brewing Company while at the resort. Unfortunately, they weren’t yet open for the season by the time we departed Beech Mountain, so we can’t comment on their beer. Check their website for more information and to see what’s on tap! 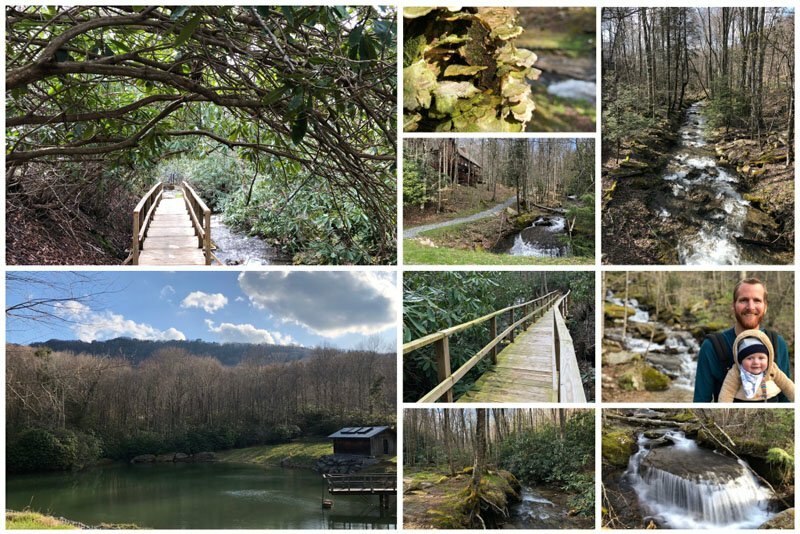 For even more hiking, fishing, fitness facilities, and family friendly activities in Beech Mountain, check out the Buckeye Recreation Area. Have a look at the Buzz Newsletter to see what’s happening during your visit and be sure to check out the 23,000 square foot, state-of-the-art Recreation Center. 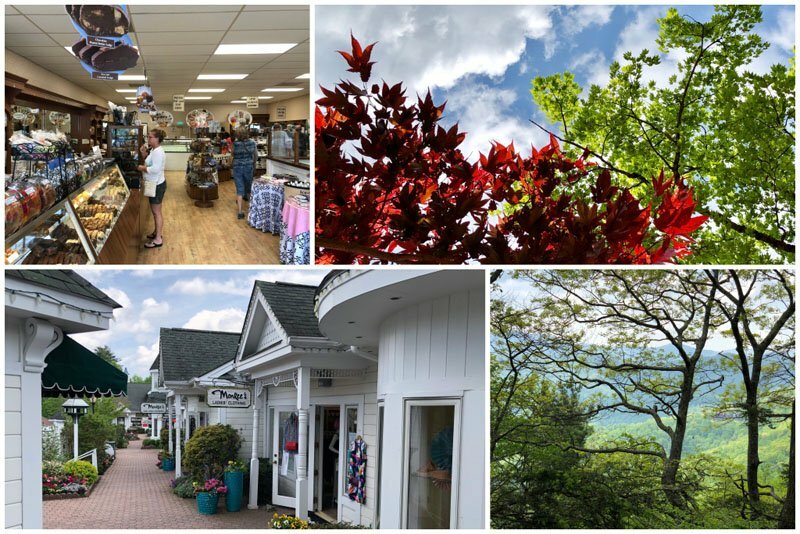 While there are plenty of things to do IN Beech Mountain, there are also countless other activities, attractions, and destinations to visit within a 1-2 hour drive. Less than 30 minutes from Beech Mountain are several entrance points to the world famous Blue Ridge Parkway. This scenic drive meanders 469 miles throughout North Carolina and Virginia. The parkway is beautifully maintained by the US National Park Service. 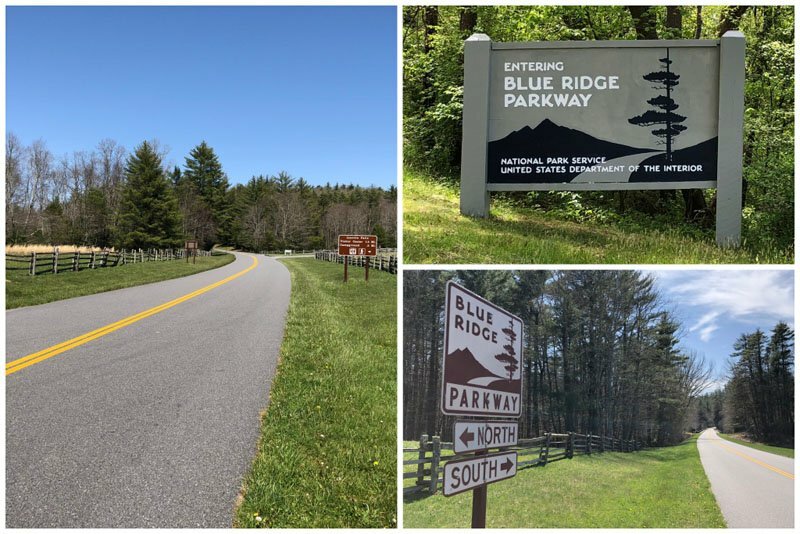 Millions of adventurers drive the parkway each year to gain access to countless trailheads, waterfalls, scenic overlooks, picnic areas, fishing spots, cultural centers, and so much more. One of many attractions along the parkway nearest to Beech mountain is Linville Falls. The Linville Falls visitors center can be found at Milepost 316.4 on the Blue Ridge Parkway. 2 different trails lead from the center to 5 various viewpoints of the waterfall. If you’re feeling up to a 4-mile hike, you can hit all 5 viewpoints. Erwin’s View Trail leads to its first overlook (Upper Falls) just a ½ mile from the visitor center. Here you’ll see water rushing through a narrow canyon before disappearing to Lower Falls 45 feet below. Chimney View is the next viewpoint, and offers the best view of the 90-foot falls. The trail ends at Erwin’s View, which offers 2 different viewpoints. The first viewpoint provides a distant glimpse of Linville Falls, North Carolina’s most photographed waterfall. 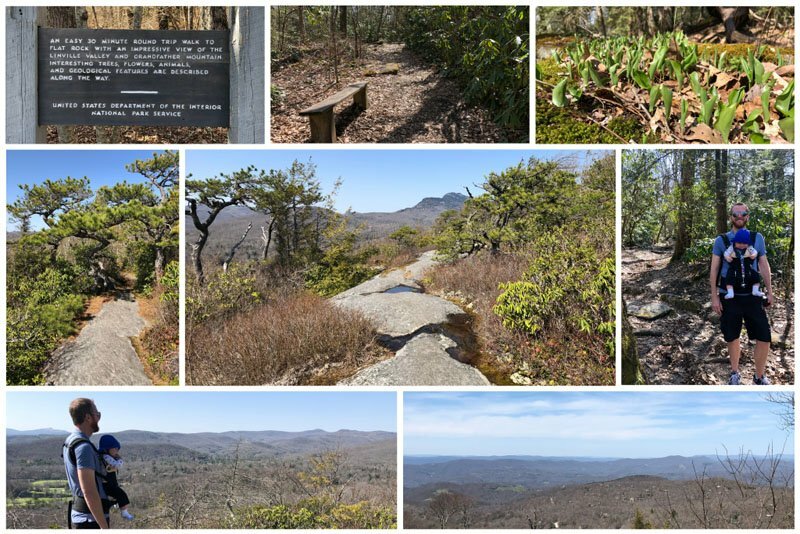 The second viewpoint requires a moderately strenuous uphill walk, but rewards hikers with a stunning view of Linville Gorge. Once you’ve taken it all in, head back to the visitor center to complete the 1.6 mile roundtrip hike. Linville Gorge Trail is the more challenging of the two trails. It requires a bit more scrambling over steps and steep spots to get down into the gorge near the base of the waterfall. But fear not, the trail is well maintained and safe for hikers. Linville Gorge Trail also takes you to the Plunge Basin Overlook, just a half mile from the visitor center. 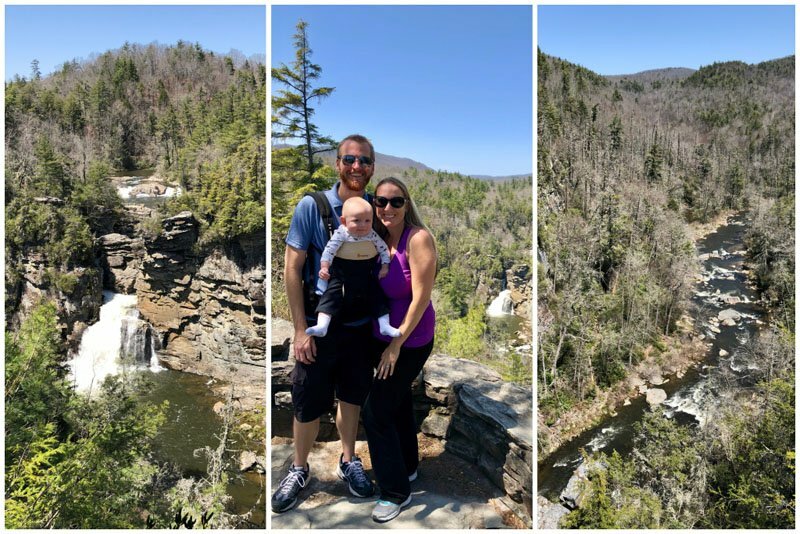 Whatever trail you choose, we have no doubt you’ll enjoy the beauty of Linville Falls! 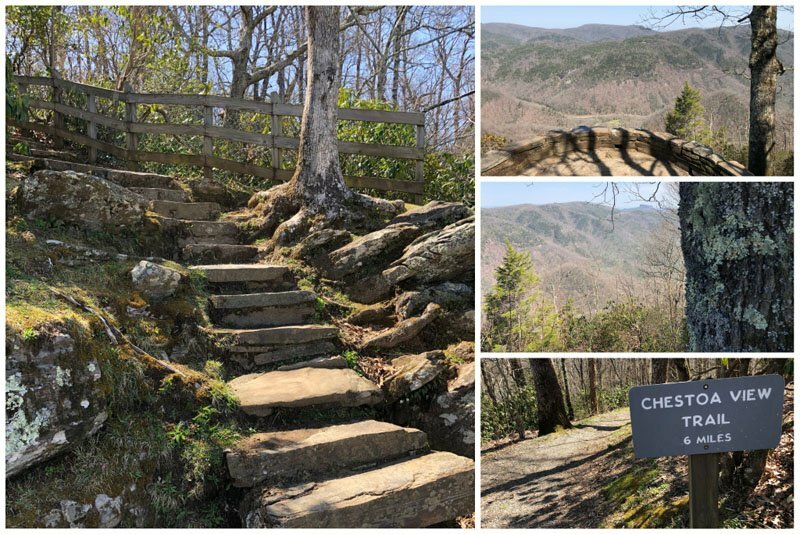 Just a short drive from Linville Falls (at milepost 320.8) is the Chestoa View trail and overlook. A quick quarter-mile hike will take you to a scenic overlook with views of Grandfather Mountain and Table Rock. An additional .6 mile forest trail will take you to an overlook offering a different view of Table Rock. At the end of this trail is a loop providing even more mountain views. No doubt it would be much more colorful and scenic with more leaves on the trees. We can only imagine how gorgeous it would look in the fall! Flat Rock Trail is a super easy wooded .6 mile loop hike. It can be accessed at Milepost 308.3 on the Blue Ridge Parkway, just 8 miles north of Linville Falls. Along the trail are educational signs about the local flora, fauna, and geological features. Once you reach the broad ‘flat rock’ summit of the trail, you have great views of Linville Valley and Grandfather Mountain. If you’ve got time, stop here and enjoy a picnic. At the trail summit, you’ll see the “bathtubs” (shallow holes) in the rock, which formed as a result of rain, wind, and cold. 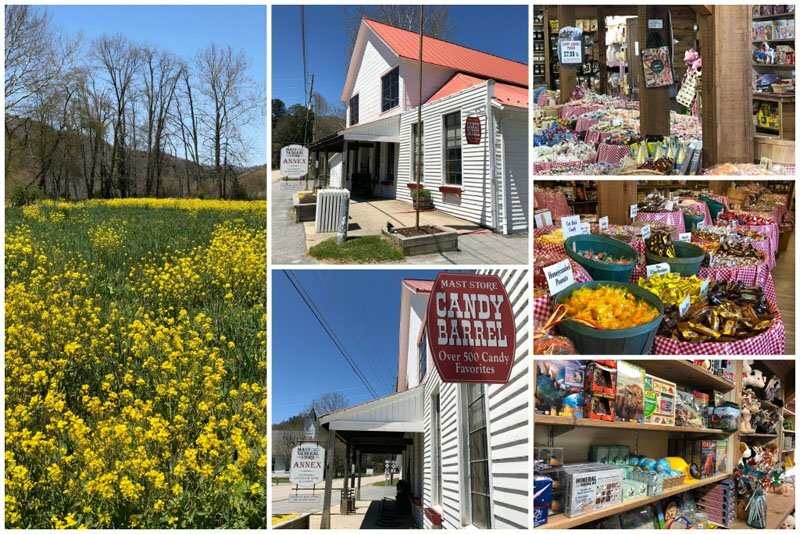 There’s not a whole lot to the community of Valle Crucis, but it’s definitely worth a stop. It’s on the way to Boone from Beech Mountain, so no reason not to visit if you’re already headed that way. 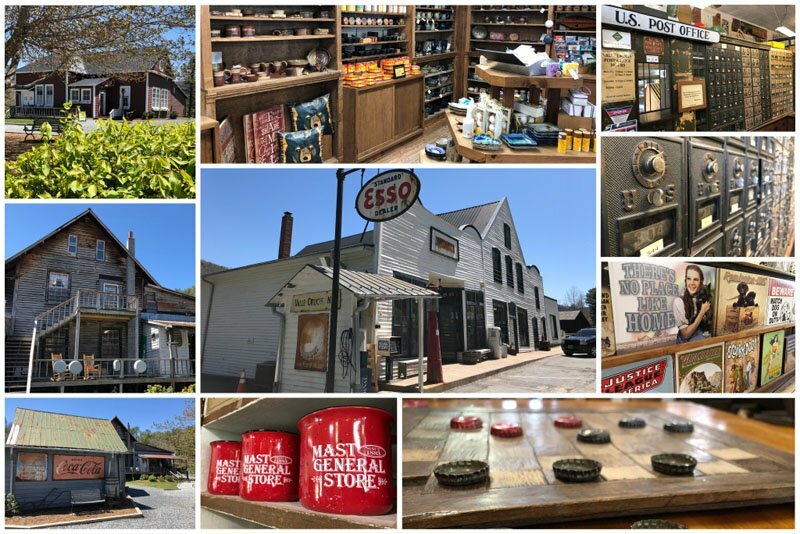 Besides the community park, Valle Crucis’ main attraction is the Mast General Store that has been in operation since 1883. With wooden floors creaking under your feet, peruse the aisles filled with cookware, country foods, toys, clothing, hardware, and plenty of neat Carolina goodies. The store also contains a functioning post office and still serves up a cup of coffee for just 5¢. Just down the street from the General Store is the Mast Store Annex. Barrels filled with candy from your childhood await, along with more clothing and outdoor gear, in addition to a neat collection of children’s toys. We absolutely adored the charming small town of Blowing Rock. The town’s name comes from a legendary rock with a fascinating legend that has since become a tourist attraction. We didn’t visit the actual Blowing Rock, but rather enjoyed the sights and flavors of the cute downtown area. The main street is lined with boutique shops and enticing places to eat. We dare you to walk past Kilwin’s Chocolates and ignore the sweet smelling invitation being waffed out the door! 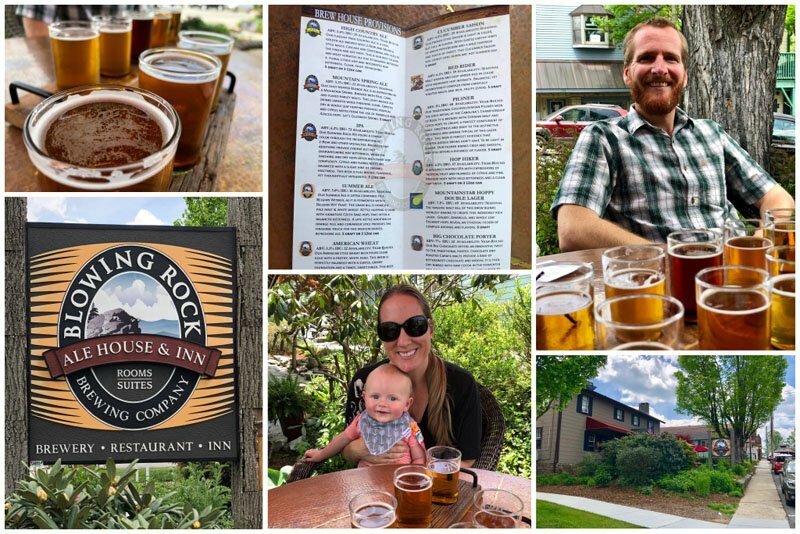 Our favorite stop in Blowing Rock was definitely the Blowing Rock Brewing Company. We were simply going to get a sample flight to see which brews we enjoyed most. There were just too many good sounding beers, so we got two flights and purchased a few cans of our favorites to go! Near Blowing Rock is Grandfather Mountain, one of North Carolina’s most popular attractions. Grandfather Mountain is most famous for its Mile High Swinging Bridge located at over 6,000 feet, which offers stunning panoramic views of the surrounding area. We did not visit Grandfather Mountain during our visit to Beech Mountain, as we simply couldn’t justify the $20 per person entrance fee. No doubt the views are gorgeous; we’d just rather enjoy free scenic views and save our money for beer! Ok, so maybe you’re starting to sense a theme here… we like beer! Fortunately, North Carolina certainly has no shortage of craft breweries to choose from. 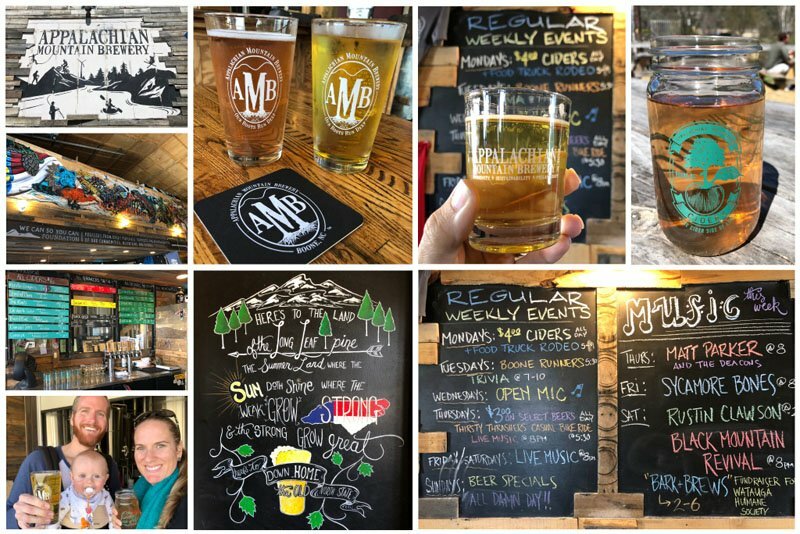 One of our favorites quickly became Appalachian Mountain Brewery in Boone, which we visited twice during our stay in Beech Mountain. It was that good! Not only is the beer delicious, but they also make their own cider. The Sinful Plum (plum and cinnamon) and Daniel Son (dry hopped) ciders were delish! On a separate trip into Boone, we got a hankering for something hearty, so we stopped by the Come Back Shack! Oh man, was that food indulgent… and filling! We followed up our dining experience with a trip to Lost Province Brewing Company. Too bad we were already full or else we would’ve enjoyed one of their delicious looking wood-fired pizzas! And yes, there is plenty more to do in Boone besides eat and drink! 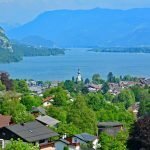 It’s a thriving college mountain town worthy of exploration, complete with shopping, galleries, scenic drives, and family friendly attractions. You’d think crossing into another state would be quite the drive from Beech Mountain, but in fact Tennessee is just a short trip away. 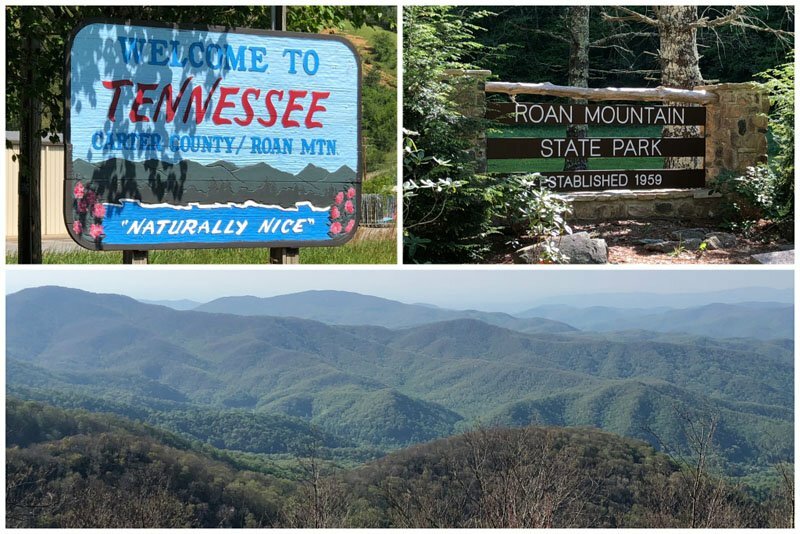 Just over the Tennessee border is Roan Mountain State Park. The highlight of this 2,000-acre park is its namesake – Roan Mountain, which peaks at an elevation of 6,285 feet. Drive up to the summit to see the rhododendrons at the Roan Mountain Gardens, where you’ll also have access to an impressive network of hiking trails. 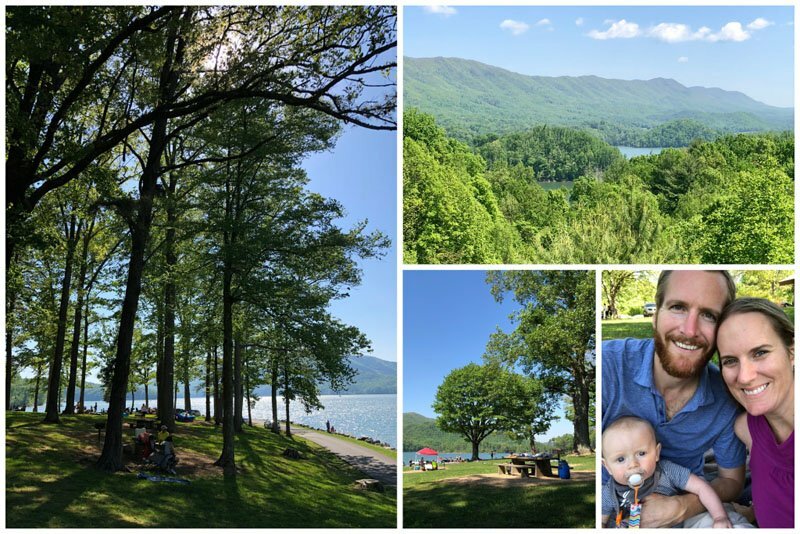 Nestled in the Appalachian Mountains is Watauga Lake, a stunning and serene landscape not far from Roan Mountain. More than half of Watauga Lake’s shoreline lies within the Cherokee National Forest and therefore cannot be developed, so there is plenty of natural beauty to be enjoyed. We spent the afternoon picnicking and relaxing at the Watauga Point Recreation Area watching the boats go by. If we ever make it back to this region, we will definitely be renting a boat ourselves! 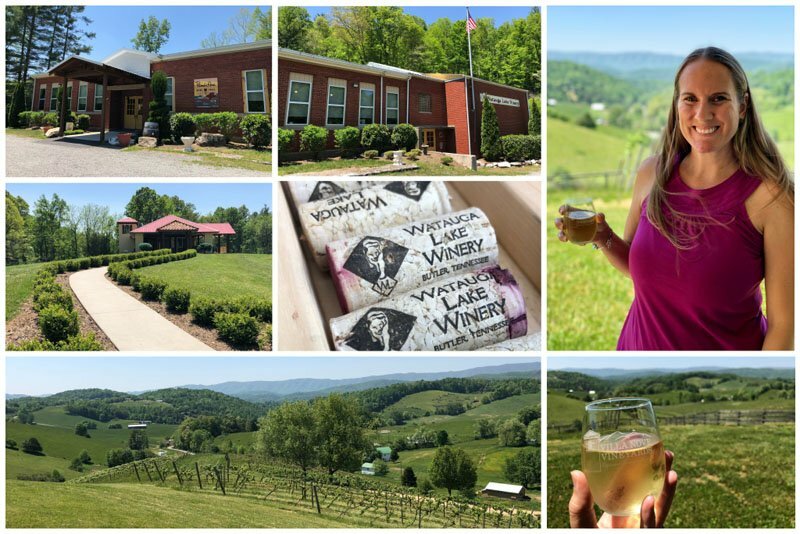 The whole reason we even found out about Watauga Lake is because someone in Beech Mountain had mentioned Watauga Lake Winery. It’s one of four wineries on the High Country Wine Trail. Watauga Lake Winery’s production area and tasting room are located in the historic Johnson County Big Dry Run Schoolhouse. The vineyards are located just 2 miles away on a stunning 35-acre property surrounding the winery owner’s personal Italian-inspired estate. Villa Nove Vineyards, as the property is called, now offers a tasting room with patio seating overlooking the rolling Tennessee hills in Johnson County. The schoolhouse and vineyards offer varied selections of their award-winning wine, so be sure to check out both locations! So, Asheville may be a little more than just a day trip from Beech Mountain, but it’s hard to resist its draw when you’re so close! Consider adding on a visit to Asheville before or after your stay on Beech Mountain. The drive will take about 2 hours, though much longer if you drive the scenic Blue Ridge Parkway. 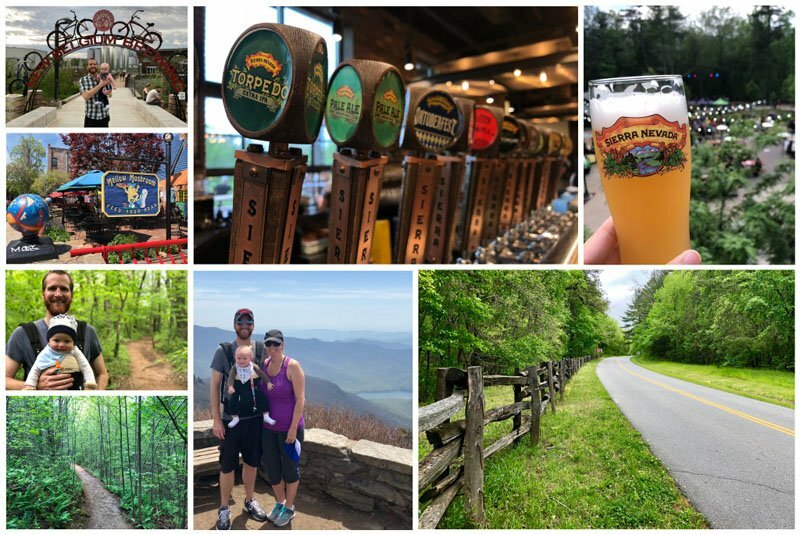 We stayed a few nights in Asheville so we could enjoy much of what there is to see and do in this eclectic town. 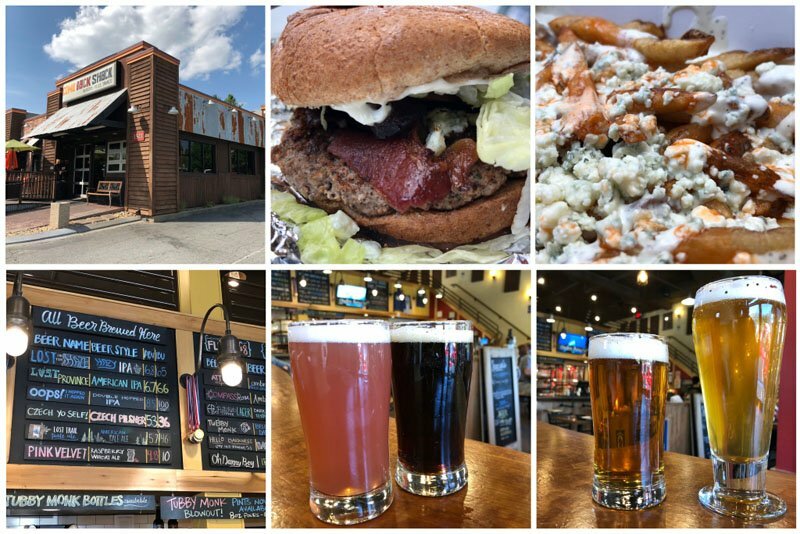 And you guessed right if you figured we hit up several of Asheville’s 26 craft breweries, including New Belgium, Sierra Nevada, Green Man, Burial, Hi-Wire, and Wedge. We also did some hiking during our time in Asheville to help burn off the beer we consumed! We definitely recommend Craggy Gardens Pinnacle Hike. It wasn’t too long or strenuous, but the trail itself and the views are spectacular. 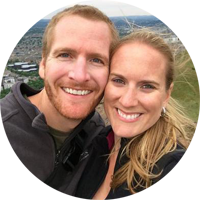 Asheville is where you’ll find one of the Blue Ridge Parkway’s main visitors centers. If you’re planning to do some exploring along the Parkway, this is great place to start! 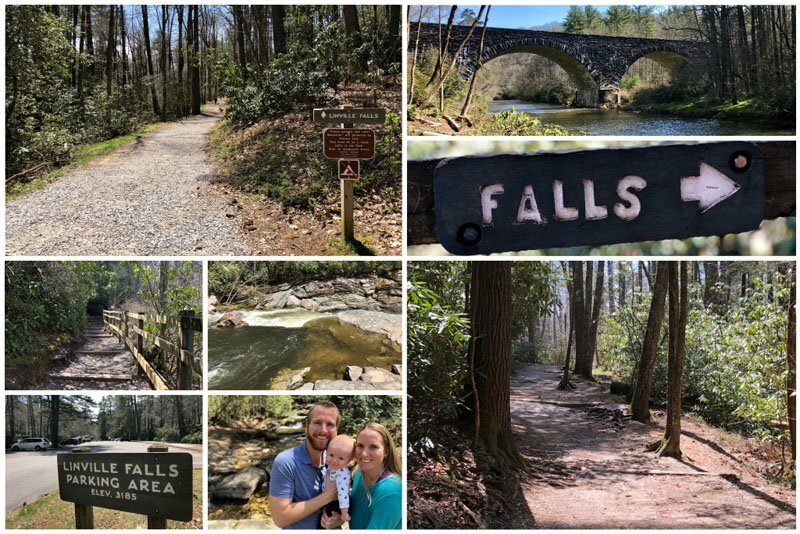 Despite all that we did during our Spring visit to the mountains in western North Carolina, there was a lot we didn’t get to experience. The trees had started to bloom in the lower altitudes, but we definitely want to visit again when all the trees and flowers are in full bloom. And yes, we’ll absolutely be back to drive the Blue Ridge Parkway one of these years when the fall colors are at their peak! So North Carolina, we’re not done with you yet!